Why would a good God allow suffering? Is the Bible really trustworthy? Is it reasonable to believe in God? Do all religions teach the same thing? Questions like these can pique curiosities, stimulate thinking, and challenge faith in God. Reasons to Believe takes ten relevant questions about God, the Bible, and the Christian life head-on and provides thoughtful, easy-to-understand responses in one concise resource. Wherever you are on your spiritual journey, Reasons to Believe can serve as a timely tool to answer questions, remove doubts, deepen Christian conviction, and provide compelling reasons to believe. 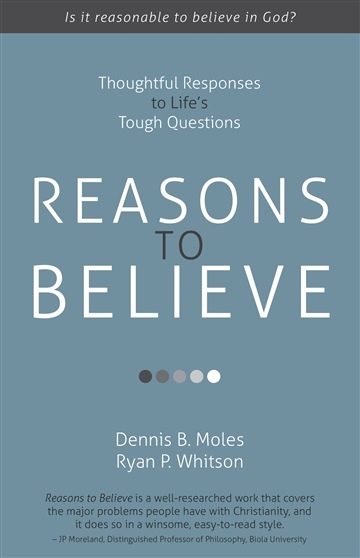 Reasons to Believe is an easy-to-understand book for the individual with questions. Ryan serves as campus pastor at Good News Community Church near Denver, Colorado, and as an adjunct professor of philosophy and religious studies. He has earned degrees at Westmont College (BA), Liberty University (MDiv), and Talbot School of Theology (DMin). Ryan is the author of Dangerous Discipleship (Parson Place Press). He loves time with his family, sports, coffee shops, and good books. them for another great resource to bolster our faith!